Self Interest is not evil, it can lead to freedom. Co-dependent, enabler, self-centered, healthy. These are the labels we might think of when we ask the question, “Whose life are we building?” The terms are thrown around often to fit a situation. But under everything are the extent and the awareness. 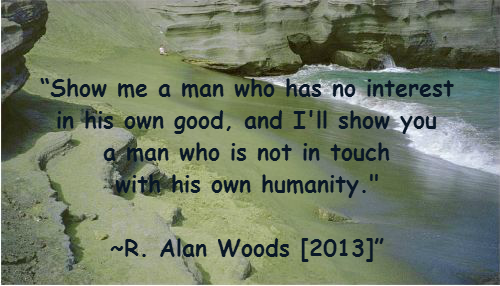 First, understand that human beings are self-interested. It has been studied for generations on end; we are hard-wired to have self-interest, as well as interest in our biological offspring. We are also wired to have an interest in those who can help with survival. For instance, it is almost a sad stereotype that a woman will sometimes help a man go through school to reach a professional career, but end up divorced, replaced by someone more acceptable to the new role. She thinks she is building her future. He may be in agreement until he develops a new point of view, or he may be only too happy to accept or allow the fantasy as he is supported through his endeavors. Then again, other times, the union will last a lifetime. What is the difference? Eyes open, antenna up and mutual agreement seem to be at the core. Ask yourself. Whose life are you building? Is it your spouse’s, as in the example above? Your children’s? Your own? Are you leaving yourself out of the picture? I am a proponent of a balanced approach. In my practice, it is common to hear that clients do not have time, money, energy, etc. to take care of themselves because someone else comes first. But if you falter, what happens to this strategy? If you are the caregiver, the enabler, the jack-of-all-trades, the get-it-done person, and you leave yourself out of the picture of your life, what will ultimately happen? This is the eyes open part. Are you acting blindly? Are you behaving this way because your upbringing says it is the only way? Do you even know you are out of the picture? That’s the antenna up. Have you discussed what you need with those around you? Have you come to a mutual understanding of how everyone’s needs and wants can be met? That’s the mutual agreement part. As you look at 2015 and beyond, stand in the middle of your world. Don’t be shy about asking for what you need. If those around you are true of heart and caring, they will bend over backwards to help you get it, just as you have bent over backwards for them. The vast majority of people are only too happy to help. If it is otherwise, perhaps your antenna has not been up.